DYERSBURG, Tenn. - A 92-year old grandmother from Dyersburg talked a would-be robber out of taking her money, by praying with him. Pauline Jacobi just finished putting her groceries in her car, when a man got into her passenger seat. That man told Jacobi he had a gun, and he would shoot her if she didn't give him all her money. 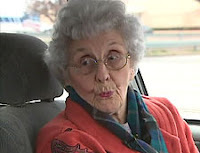 The spunky 92-year old said no, and then she started talking with the would-be robber. "I said Jesus is in this car and he goes with me everywhere I go. He just looked around and the tears just began coming down his eyes," Jacobi said. Jacobi talked with the man for several more minutes. Then he said he was going to go home and pray. The grandmother then willing gave him all the money she had on her, which was $10. Wow. What an amazing woman. Thanks for sharing that, Bob. That is an amazing story. I'm sure she changed that man's life. Reminds me of Jean Valjean in Les Miserables. woweeee! Go Pauline!! Not sure I'd have that bravery. Praise the Lord, i was so blessed with that story. May God bless her & family all the time.